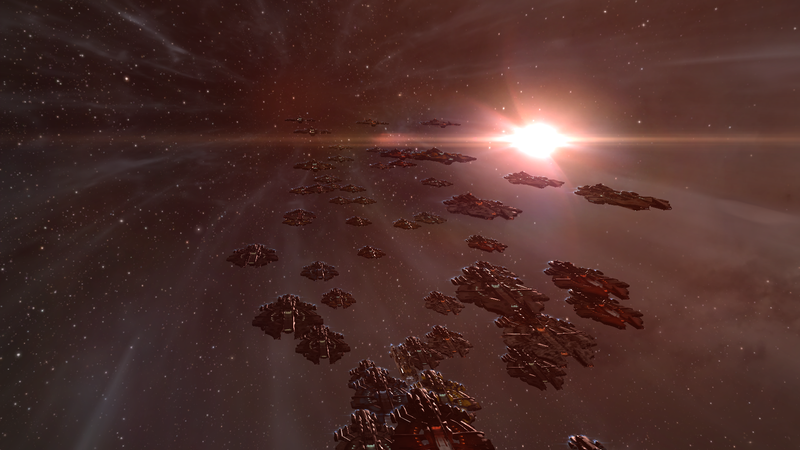 A fleet of supercarriers in mid-warp. It takes a special sort of character to lead a fictional armada into battle. Those few that have what it takes are household names. James T. Kirk. Admiral Ackbar. Doomchinchilla. … Doomchinchilla? Okay, he may not be famous outside of EVE Online, but inside it, Doomchinchilla is reknowned for commanding one of the longest-standing and most-feared Supercapital forces the game has ever seen. Most recently, that fleet has been suffering at the hands of an enemy “hellcamp” after the fight of UALX-3, and Kotaku was able to get in touch with Doomchinchilla via Discord to find out what that really meant. /u/Cymek’s rendition of Doomchinchilla waging war on TEST Alliance. EVE Titan fleet waiting for prey to log in. “We won the objective, and the ISK war. It can be argued that we didn’t win the objective because of the other keepstar, but if goons give you a new keepstar, nothing we can do about it,” Doomchinchilla said. A gap begins to form in the Hellcamp. Emboldened by these factors, a massive force of Pandemic Legion Titans logged in, prepared to face the camp and attempt to escape. Persistence and planning were on their side, and the majority of the titans were completely free of interference, and able to escape the system unscathed. EVE Twitch Streamer catches Titans exiting the camp. Now that the fleet has escaped the hellcamp, the southern end of the EVE universe is once again poised on the brink of another major conflict in the coming war. Since I am an EVE player myself, and actively engaged on the opposite side of the war as Doomchinchilla, he did not offer up exactly what Pandemic Legion forces had planned for their next move, but he did assure me that they weren’t anywhere near done. This war is showing all of the signs of becoming one for the history books, as neither side is willing to back down any time soon. EVE Online has been at a relative state of peace for quite a while, and many players are excited to see a massive, server-wide war beginning.